Need to refresh the App Store or iTunes Store from a computer? 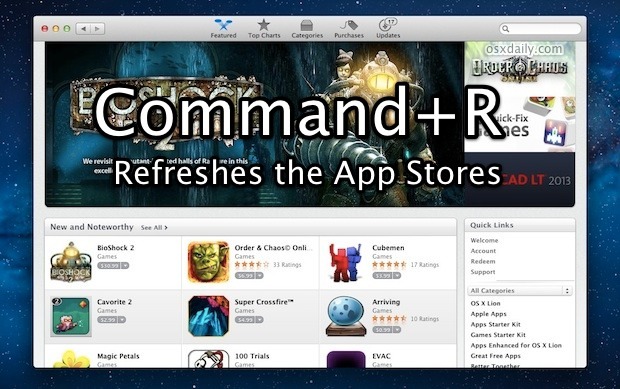 To quickly refresh the App Store on Mac OS X, just hit Command+R at any screen in the iTunes, iOS App Store, or Mac App Store, and the page will reload with whatever new data awaits, whether it’s a revised Top Charts listing or just to see the latest Featured apps. You can refresh any screen in any of the Apple iTunes Stores, iBooks Store, or App Stores with this method as long as you’re on the desktop clients. The Command+R trick works from the Mac for the Mac App Store and iOS App Store, whereas Control+R is the refresh keystroke for Windows in iTunes. Reloading an App Store page is also an easy way to resolve quite a few common issues, like when the App Store claims to be inaccessible, new app updates aren’t displaying properly, or when recently purchased items are missing from the Purchased list. If something is still not appearing in the purchases list after a refresh, it could be hidden, here’s how to unhide it. Note this is for the desktop versions of the App Store either in the Mac App Store or the iTunes App Store. On the mobile side of things within iOS, you can typically just quit and relaunch iTunes or the App Store to resolve any problems. You can also use the interesting repeat-tap trick to force refresh iOS App Store. If that doesn’t work for iOS, you may need to manually force quit the App Store itself or even reboot the device to fix stalled downloads and force updates to the page as there is no direct refresh trick like there is on the desktop. All the solutions mentioned, even on the Apple forum, do not work for everyone. This seems to be a bug in ios6. Apple needs to address it.